Skype Qik: The new mobile video messaging. With all the buzz around snapchat, Instagram video, and the like, Microsoft of course wanted a piece of that. Qik, which started off as a video streaming service which actually beat YouTube to streaming video directly from mobile devices, was acquired by Microsoft a few years back and was just recently retired in April. Now it's making a comeback as a new light weight video-messaging app: Skype Qik. Skype Qik strives to make sharing video as simple as possible, and they couldn't have made it any simpler if they tried. You install the app and sign up with your phone number, after that, you simply start sending video to you friends. The interface is extremely simple, there's a red record button on the bottom as well a a button to switch between the rear and front facing camera. 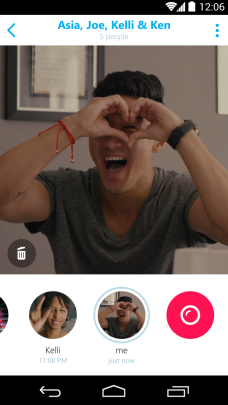 Unlike all the other video messengers out there like Instagram, Snapchat, Facebook messenger, or even Skype itself, Qik is pure video, no audio, no chat, just video. The person you send the video do does need the app in order to see your video, but they'll get a nice text telling them how to download the app, and then your videos will be there waiting for them. Skype Qik offers users better control over sent videos as well. If you realized you sent your friends something you didn't want to send, deleting it from your phone will wipe it of all of theirs as well. There is also no way to save videos within the app and taking a screenshot of a video doesn't so a whole lot. Qik Flik is an option in the app to take a 5 second video to be stored and used later, sort of like a reaction GIF you want to save for later. While a android and iOS versions can both send and receive Qik Fliks, the Windows Phone version can only receive them at the time of writing this. Odd for Microsoft's own device.